On many public transport systems, they go out of their way to encourage what we in Melbourne call Passes — sometimes called Season Passes, Periodicals, Monthly or Yearly tickets: a fixed price for unlimited travel for a period. For the system, the benefits include reduced transaction costs, getting a bunch of money up front, and the promise of customer loyalty, at least for the Pass duration, but also beyond that if they like the discount and the service and renew. For the passenger, they get a nice discount, and they don’t have to bother with queuing and buying more tickets for a while. In some places, they don’t even need to get their ticket out unless asked by an inspector. Passengers can also use the Pass for any travel they like during that time, for instance weekday commuters might use it for social or recreational travel on weekends or evenings. Personally I think the loss of these benefits is probably forgiveable. Bringing across every single fare oddity into a new system is part of what has made Myki so trouble prone. There’s a good argument that they should have simplified things further, such as scrapping the Weekly Pass and using an automatic Weekly Cap instead. But I digress. The bigger effect of Myki, and in particular its compulsory use in Melbourne since the end of 2012, is that the Pass discount is now greatly diminished. How many days does a Pass cost? Weekly fares were about the cost 4.3 Dailies, from the 90s, right up to 2012. Since Daily fares were moved onto Myki Money, which is at a cheaper rate (since it was originally intended to sit alongside 2-hour and Daily short term/single use tickets), a Weekly fare is now equivalent to 5 weekdays. In other words, the Weekly fare is no longer a great proposition, unless you know for sure that you’ll travel more than 5 days a week. If you’re not sure, or you never use public transport at weekends, you might as well use Myki Money. A Monthly/30 Day Pass had been about the cost of 16.2 Dailies, making it a very attractive proposition for daily commuters. It’s now the cost of 18.4 weekdays, making it less compelling for 9-5 workers who might only have 20 days’ use in the month if they never use public transport on weekends. A lot of people buy 33-day Passes, and have them start on a Monday, and end on the Friday five weeks later, avoiding paying for an intermediate weekend if they are unlikely to use it. With some planning ahead, you can also adjust the number of days (anywhere between 28 and 325) to fit in with public holidays or leave from work. Yearlies used to be about the cost of 171 Dailies. They are now up at the cost of 199 weekdays. For metropolitan passengers, there’s no reason to ever pay retail price for a Yearly. Get the Commuter Club discount via your workplace or PTUA instead. Happily, the combination of the Yearly discount and the Commuter Club discount still makes it a pretty good deal for most everyday users, as long as they can afford the initial outlay (or their workplace can pay it via monthly deductions). What about the weekend cap? My calculations are perhaps a little shaky, but the figures come out significantly worse if you take into account that some days in a Pass would be subject to the $6 weekend/holiday daily cap, not the weekend price. Including the weekend cap in the calculation, a Weekly costs the same as 5.3 days (assuming no public holidays). A 30-day Pass is 23 days (also assuming no public holidays in the month). A Yearly is around 251 days (assuming 12 public holidays per year). 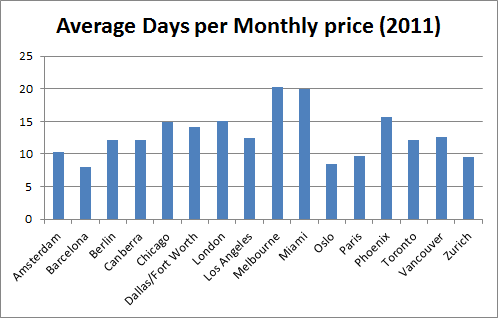 The average for the other cities in the study was 12.5 days, and the European cities in particular had deep discounts for Monthly fares. The prices may have changed a bit since then, particularly as many cities have moved to smartcards in the mean time, and changed their fare structures. For instance in Vancouver it appears the Monthly has moved up from 12.67 then to about the price of 15.5 days now (based on two single fares with transfers). But most of them still seem to price their Monthlies cheaper than Melbourne. 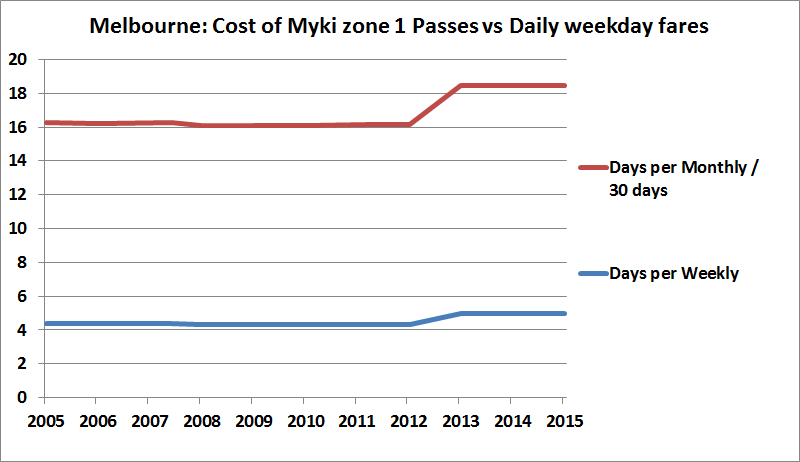 I’m certainly not arguing that Myki Money fares should go up. The discount from paper tickets is a reasonable one, given the inconvenience of having no paper tickets available. Given Melbourne’s Weekly Pass discount is negligible for most users, it might be time to revisit whether an automatic Weekly Cap (once proposed, and partly implemented) can easily replace it. A Monthly cap was also once proposed, but seems to have been excised at an early stage. But to encourage regular users, the Monthly/Yearly price should really come down, at least to reflect the cut in daily fares that occurred when everybody got forced from paper tickets onto Myki. In Sydney, the move to a smartcard completely eliminated time-based passes – the card only stores value, an amount is deducted on each trip. To make up for that, they introduced some arbitrary discounts and caps; you never pay more than $15 in a day or more than $60 in a week, and in any given week (Mon-Sun) every trip after the 8th “journey” is free. The definition of “journey” makes things a bit tricky, as multiple trips (even if changing mode of transport) with less than a one-hour interval between trips still counts as the same “journey”. This creates some seemingly unfair results, and also provides quite a few opportunities to game the system. Yep, people on monthly/annual passes in Melbourne are being ripped off. Thanks for confirming what we all were thinking. Yes, thanks for that heads up with the weekly pass. The majority of users of a weekly ticket would be those people who work monday to friday, and for people to want to use them, a weekly needs to be no more than the value of five daily tickets. Are the people in charge crazy enough to adjust the weekly fare to that of six or seven daily tickets? I fear yes. Once upon a time, I would have said that a weekly ticket needs to be not much more than 4 daily tickets. 4.3x is perhaps a little more than what I would have done. A monthly ticket needs to be worth less than four weekly tickets in order to be worthwhile. Four weekly tickets last for 28 days. Naturally, to have a yearly pass needs to be less in value than whatever 12x of your monthly tickets are, to encourage people to get one of them rather than 12x monthlies. Today with the modern smart cards, things are changed somewhat in that you can now do as what Willson said about the Sydney system. Just introduce weekly and monthly caps. Having said that, I wish I could buy a daily pass with MyKi. On the matter of having free weekend travel system wide for your family, that would be nice, but not important. Modern automatic gates would not work well with the idea that you may have more than one person with you on that one ticket. On the matter of passes, I do feel it would be an advantage for the system to permit or prefer the use of passes. All the system needs to do is check, ok there is a pass, so through you go. With MyKi money it must delay for a split second to work out your correct fare and deduct that from your card. Quicker processing should mean less strain on the system, and being better able to handle more people at once. I yield to no-one in my support for a comprehensive and convenient public transport system but, frankly, this is – probably entirely unintentional – good sense on the part of PTV. The sorts of people who buy (full-fare) passes are going to be the most price insensitive users of public transport: lots of them CBD workers in relatively well-paying white-collar jobs. Making them contribute more to the funding of the system by reducing the discount they get by buying a pass is unlikely to send them back to their cars. Any idea how the Myki weekly cap was supposed to work? With the extension of Zone 1 a single $ cap would be more palatable option now. Following on from Michael and his “people who buy (full-fare) passes are going to be the most price insensitive users of public transport” point – another way to make passes more attractive without needing to cut the price is to remove the touch on / touch off requirement. V/Line’s paper tickets used to work the same way, and the convenience of just running onto a train if you are running late is hard to beat. @Wilson, thanks – I knew about Opal’s $15 daily cap, and the 8 journeys then free stuff – I hadn’t noticed the $60 weekly cap as well. Like the other caps, it’s a bit of a blunt instrument. @Jim, why do you want to buy a daily pass? You have a daily cap – it does it automatically, without the risk that a change of travel plans will have you paying more if you only end up making one journey. @Michael, the same formula applies to concessions, who most definitely are price sensitive. The recent price cut for zone 1+2 commuters (many of whom were formerly zone 1+2+3 commuters) shows they aren’t really coming at it from a planned, considered point of view. @Andrew, as far as I know, it would have stopped charging you after X days (presumably 5), but like daily caps would have been dependent on which zone(s) you used. Bear in mind V/Line runs services outside zone 1/2 on which Myki is valid, so it would need to work for those too. I don’t understand why the system has a flat fare for distance and yet no reasonable discount for people who travel regularly. The weekly rate should be set at 3.5 days at the most, remembering that our fares are generally high to begin with especially with short fares that are extremely high per kilometre. Many businesses provide discounts and incentives to regular customers in the form of loyalty points and other discounts. In regards to not having to touch on and off would be convenient however the operator would not be able to see where services are required and cannot plan services accordingly. But Daniel, the concession card holders already get a concession – why should some concession card holders get an even bigger discount than others? @Daniel. but assuming X=5, say you had 3 Z1 days and 2 Z2 day then would you have gotten anything? Actually, 5 makes it a bit easier, free weekend travel for everyone in Z1/Z2. I don’t suppose you’d want to extend travel to the whole system as Opal stupidly does after 8 journeys. I think the best system is to get some sort of (expiring) monetary credit after a certain number of fares proportional to that spend which rewards all frequent users whatever their travel pattern. I’m not sure what’s to be gained by providing discounts to frequent users who are kind of a captive market beyond a certain point. X=5 is right for most people and gives free travel on the weekend hopefully encouraging people to stop using cars on the weekend. That also allows base fares to be a low as possible which encourages less frequent price sensitive users.